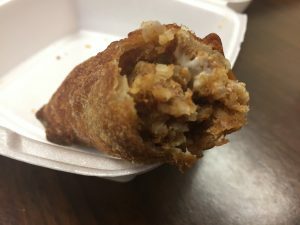 What might be mistaken for an eggroll is Bergeron’s Boudin and Cajun Meats of Bossier City’s twist on a Cajun favorite. Sold at both the Bossier City (3933 Benton Road) and Shreveport locations, this wrap is quickly becoming a Bossier City must-have. The eggroll shell is crispy on the outside but soft in the middle. The flavor of this wrap hits you at about your second bite in – depending on the size of your bites. It’s creamy and not too spicy. The freshness of the boudin pairs well with the delicately-seasoned taste of the pepper jack. The next time you are ordering meat here, be sure to add this to the tray. Have you ever tried a burger that tastes like it is melting in your mouth? 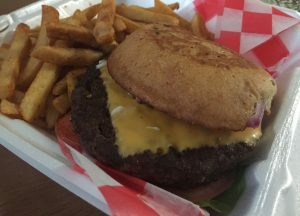 The Geaux Burger is what many in Bossier City call the best burger on this side of the Red River. The burger is big – I’m talking big enough to share. But believe me, you will want to try to finish every bite of the Geaux classic. The Bossie bite is dressed like an average burger. The red onions are chopped as the pickles fill the top of the bun. Paired with the perfect seasoned fries, this signature burger is almost too intimidating to pick up, after all it is 10 ounces of a sirloin patty. It’s messy but delicious. Pro Tip: Order it on jalapeno bread. If you think pumpkin spice is the taste of the fall season, you probably weren’t raised in Bossier City near Gumbo to Geaux. Once this dark roux hits the tongue, it takes you into the season most of us are eagerly awaiting. The roux is what makes this gumbo. The flavor must be something the North Louisiana Cajun gods may have created. The sausage isn’t spicy but provides a hearty mix to the chicken. If you want to be a “geaux pro” get this gumbo to go and bring it to your favorite friday night football matchup. Perhaps Parkway versus Airline? 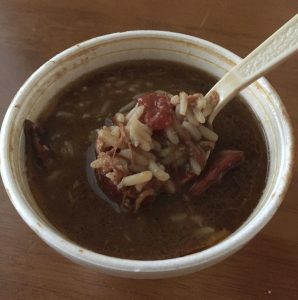 No matter who wins, this gumbo is the taste of a southern victory. For a more distinctive (north) Cajun menu you may have to travel off the beaten path. To find a menu with entrees with a bit of Cajun French, you will have to drive further. Just outside of downtown Haughton lies a Louisiana classic restaurant known mostly to Bossier Parish natives. When most want a crispy piece of catfish, a hearty steak or a unique Louisiana creation, the locals go to Swamp Daddy’s. 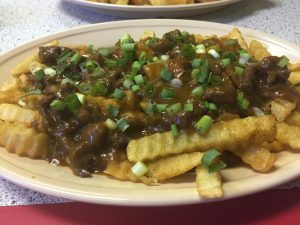 Try a twist on a dish similar to poutine but with a Cajun Bossier Parish personality. Cypress Knees starts with a bed of crispy crinkle cut fries served on a platter that quickly get smothered in crawfish etoufee. Garnished with a few chives, this dish is side and a Cajun notable married to become one. Make sure to add the sour cream on top. The cream cools down the etoufee and balances out the taste of the entree. There’s also other creative items under the lagniappe section of the menu. Next time try the Voodoo Tater, a baked potato filled with crawfish etouffee and fried popcorn shrimp, or the Couillon Crawfish Etoufee, crawfish etouffee with rice served over fried popcorn shrimp. You can’t complete a list of Louisiana classics found in Bossier Parish without saving room for dessert. Though Crescent City Bistro’s dessert menu isn’t extensive, the restaurant is doing two Louisiana classic very well. In fact, choosing one was down right difficult. Bread Pudding or Beignets? But how could anyone say “no” to White Chocolate Bread Pudding? After ordering, you smell the sweet scent before it is brought out. 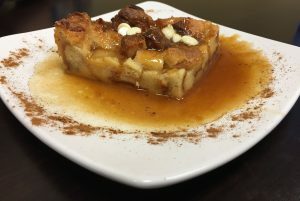 As your sweet tooth aches, the perfect looking bread pudding wedge arrives on your table. Every bite makes the next more irresistible. The sweet and beautify brown dessert glistens in a wading pool of cinnamon and vanilla syrup, just begging to be dragged back through the taste as you bring the fork to you mouth. It’s nice to share, but not with this dessert. Encourage your guests to get their own. Also, Crescent City Bistro will move to its new location at 2175 Airline Drive in late October still remaining a delicious choice for a Bossier bite. What did we miss? Tell us in the comments so we can update this article with fan favorites.